This tutorial introduces you to JUnit 5. We’ll start by installing JUnit 5 and getting it setup on your computer. I’ll give you a brief tour of JUnit 5’s architecture and components, then show you how to use new annotations, assertions, and assumptions in the JUnit Jupiter API. In Part 2, we’ll take a deeper tour of JUnit 5, including the new JUnit Jupiter Extension model, parameter injection, dynamic tests, and more. For this tutorial, I used JUnit 5, Version 5.0.2. JDK 8 for Windows, Mac, and Linux. Eclipse IDE for Windows, Mac, and Linux. Apache Maven for Windows, Mac, and Linux. Gradle for Windows, Mac, and Linux. Git for Windows, Mac, and Linux. In this tutorial, I’ll show you how to run JUnit Jupiter tests using Gradle. The demonstration is optional, but I encourage you to learn Gradle. It’s a neat build system, and increasingly popular. It’s coming soon to a project next to you — I guarantee it! It’s tempting to use the terms JUnit 5 and JUnit Jupiter synonymously. In most cases, this is a benign interchange. It’s important, however, to understand that the two terms are not the same. JUnit Jupiter is the API for writing tests using JUnit version 5. JUnit 5 is the project name (and version) that includes the separation of concerns reflected in all three major modules: JUnit Jupiter, JUnit Platform, and JUnit Vintage. When I write about JUnit Jupiter, I’m referring to the API for writing unit tests. When I write about JUnit 5, I’m referring to the project as a whole. Prior versions of JUnit were monolithic. Aside from the inclusion of the Hamcrest JAR in version 4.4, JUnit was basically one big JAR file. Its APIs were used by both test writers—developers like you and me—and tool vendors, who used many of the internal JUnit APIs. An API for writing tests. An API for discovering and running those tests. If you look closely at Figure 1, it starts to sink in just how supremely cool JUnit 5’s architecture is. Go ahead, really stare at it. What the boxes in the top-right corner show is that the JUnit Jupiter API is just another API as far as JUnit 5 is concerned! Because JUnit Jupiter’s components follow the new architecture, they work with JUnit 5, but you could just as easily define a different testing framework. As long as a framework implements the TestEngine interface, you can plug it into any tool supporting the junit-platform-engine and junit-platform-launcher APIs! I still think JUnit Jupiter is pretty special (after all, I’m about to spend an entire tutorial talking about it), but what the JUnit 5 team have done is truly groundbreaking. I just wanted to point that out. Please feel free to stare at Figure 1 until we are in wholehearted agreement. The API against which we write tests. The JUnit TestEngine implementation that understands that particular API. For this tutorial, the former is the JUnit Jupiter API, while the latter is the JUnit Jupiter Test Engine. I’ll introduce them both. As a developer, you’ll use the JUnit Jupiter API to create unit tests that exercise your application code. Using the API’s basic features—annotations, assertions, and so forth—is the main focus of this part of the tutorial. The JUnit Jupiter API is designed so that you can extend its functionality by plugging into various lifecycle callbacks. You’ll learn in Part 2 how to use these callbacks to do cool things like run parameterized tests, pass arguments to test methods, and lots more. 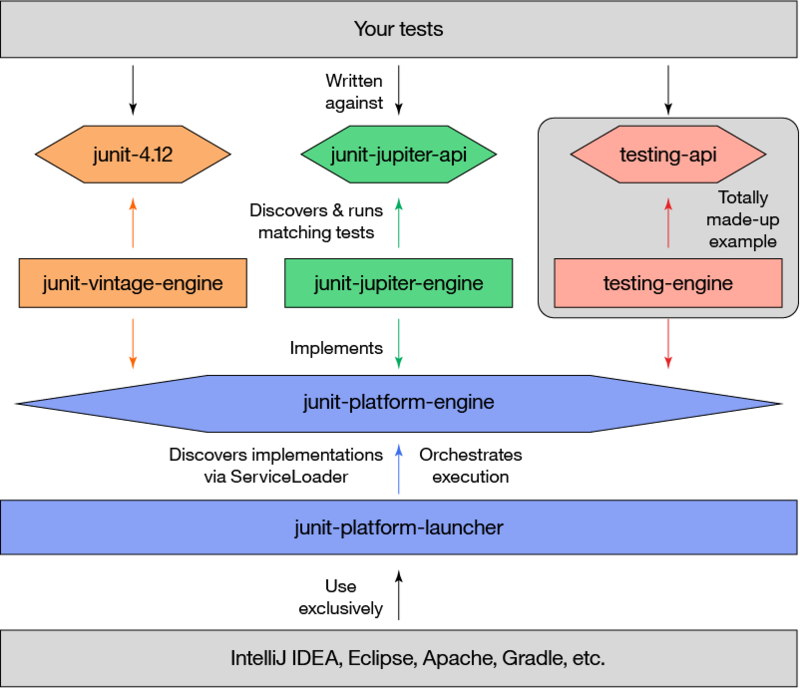 You’ll use the JUnit Jupiter Test Engine to discover and execute your JUnit Jupiter unit tests. The test engine implements the TestEngine interface, which is part of the JUnit Platform. You can think of the TestEngine as the bridge between your unit tests and the tools you use to launch them (like your IDE). Discovery of tests and the creation of a test plan. Launching the test plan in order to (1) execute tests and (2) report results to the user. The API for discovering tests and creating the test plan is part of the JUnit Platform, and is implemented by a TestEngine. The testing framework encapsulates the discovery of tests into its implementation of a TestEngine. The JUnit Platform is responsible for initiating the test discovery process, using IDEs and build tools like Gradle and Maven. The test plan is a hierarchical view of all the test classes, test methods within those classes, test engines, and so on, that were discovered according to the test specification. Once the test plan is prepared, it’s ready to be executed. The API for executing tests is part of the JUnit Platform, and is implemented by one or more TestEngines. Testing frameworks encapsulate the execution of tests into their implementation of TestEngine, but the JUnit Platform is responsible for initiating the test execution process. Test execution is initiated through IDEs and build tools like Gradle and Maven. A JUnit Platform component called the Launcher is responsible for executing the test plan created during test discovery. Some process—let’s say your IDE—initiates test execution through the JUnit Platform (specifically, the junit-platform-launcher API). At that time, the JUnit Platform hands the Launcher the test plan, along with a TestExecutionListener. The TestExecutionListener will report test execution results for display in your IDE. The goal of the test execution process is to report to the user exactly what happened when the tests ran. This includes reporting test successes and failures, and messages accompanying the failures to help the user understand what happened. Many organizations have a significant investment in JUnit 3 and 4, and thus cannot afford to convert wholesale to JUnit 5. Knowing this, the JUnit 5 team have provided the junit-vintage-engine and junit-jupiter-migration-support components to assist with migration. As far as JUnit Platform is concerned, JUnit Vintage is just another test framework, complete with its own TestEngine and API (specifically, the JUnit 4 API). Figure 2 shows the dependencies among the various JUnit 5 packages. Test frameworks that support JUnit vary in how they process exceptions thrown during test execution. There is no standard for testing on the JVM, which is an ongoing issue for the JUnit team. Beyond the java.lang.AssertionError, test frameworks are forced to either define their own exception hierarchy or couple themselves to exceptions supported natively by JUnit (or in some cases they may do both). Support opentest4j: To participate in the Open Test Alliance for the JVM, or simply provide feedback to help move the effort forward, visit the opentest4j Github repo and click on the CONTRIBUTING.md link. Now that you have a basic grasp of how the various JUnit 5 components fit together, it’s time to write some tests using the JUnit Jupiter API! Since JUnit 4, annotations have been a core feature of the testing framework, and that continues with JUnit 5. I don’t have space to cover all of JUnit 5’s annotations, but this section will get you started with the ones you’re likely to use most. First, I’ll compare the annotations from JUnit 4 with those from JUnit 5. The JUnit 5 team changed the names of some annotations to make them more intuitive, while keeping the functionality the same. If you’ve been using JUnit 4, the table below will help you orient to the changes. @Test @Test The annotated method is a test method. No change from JUnit 4. @BeforeAll @BeforeClass The annotated (static) method will be executed once before any @Test method in the current class. @BeforeEach @Before The annotated method will be executed before each @Test method in the current class. @AfterEach @After The annotated method will be executed after each @Test method in the current class. @AfterAll @AfterClass The annotated (static) method will be executed once after all @Test methods in the current class. @Disabled @Ignore The annotated method will not be executed (it will be skipped), but reported as such. Next we’ll look at a few examples using these annotations. While some have been renamed in JUnit 5, their functionality should be familiar if you’ve been using JUnit 4. The code in Listing 1 is from JUnit5AppTest.java, which you’ll find in the HelloJUnit5 sample application. Line 1: Along with its parameter JUnitPlatform.class (a JUnit 4-based Runner that understands JUnit Platform) @RunWith lets you run JUnit Jupiter unit tests inside of Eclipse. Eclipse does not yet natively support JUnit 5. In the future, Eclipse will provide native JUnit 5 support, and we’ll no longer need this annotation. Line 2: @DisplayName tells JUnit to display the String “Testing using JUnit 5” rather than the test class name when reporting test results. Line 9: @BeforeAll tells JUnit to run the init() method oncebefore all @Test method(s) in this class are run. Line 14: @AfterAll tells JUnit to run the done() method onceafter all @Test method(s) in this class are run. Line 19: @BeforeEach tells JUnit to run the setUp() method beforeeach@Test method in this class. Line 24: @AfterEach tells JUnit to run the tearDown() method aftereach@Test method in this class. Line 29: @Test tells JUnit that the aTest() method is a JUnit Jupiter test method. Line 37: @Disabled tells JUnit not to run this @Test method because it is disabled. An assertion is one of a number of static methods on the org.junit.jupiter.api.Assertions class. Assertions are used to test a condition that must evaluate to true in order for the test to continue executing. If an assertion fails, the test is halted at the line of code where the assertion is located, and the assertion failure is reported. If the assertion succeeds, the test continues to the next line of code. All of the JUnit Jupiter assertion methods listed in Table 2 take an optional message parameter (as the last parameter) that displays if the assertion fails, rather than the standard default message. assertEquals(expected, actual) The assertion fails if expected does not equal actual. assertFalse(booleanExpression) The assertion fails if booleanExpression is not false. assertNull(actual) The assertion fails if actual is not null. assertNotNull(actual) The assertion fails if actual is null. assertTrue(booleanExpression) The assertion fails if booleanExpression is not true. Listing 2 is an example of these annotations in use, from the HelloJUnit5 sample application. Line 13: assertEquals: If the first parameter value (4) does not equal the second (2+2), then the assertion fails. The user-supplied message (the third parameter to the method) is used when reporting the assertion failure. Line 16: assertFalse: The expression nullValue != null must be false or the assertion fails. Line 17: assertNull: The nullValue parameter must be null or the assertion fails. Line 18: assertNotNull: The String literal “A String” must not be null or the assertion fails, and the message “INCONCEIVABLE!” is reported (instead of the default “Assertion failed” message). Line 19: assertTrue: If the expression nullValue == null does not evaluate to true the assertion fails. In addition to supporting these standard assertions, the JUnit Jupiter AP provides severaI new ones. We’ll look at two of them below. The cool thing about assertAll() is that all of the assertions contained within it are performed, even if one or more of them fail. Contrast this to the code in Listing 2, where if any assertion fails, the test fails at that point, meaning no other assertions will be performed. Under certain conditions, the class under test is expected to throw an exception. JUnit 4 provided this capability through the expected = method parameter, or through a @Rule. In contrast, JUnit Jupiter provides this capability through the Assertions class, making it more consistent with other assertions. An expected exception is considered to be just another condition that can be asserted, and thus Assertions contains methods to handle this. Listing 4 introduces the new assertThrows() assertion method. Note Line 9: If the call to classUnderTest.add() does not throw an IllegalArgumentException, then the assertion fails. Assumptions are similar to assertions, except that assumptions must hold true or the test will be aborted. In contrast, when an assertion fails, the test is considered to have failed. Assumptions are useful when a test method should only be executed under certain conditions—the assumption. An assumption is a static method of the org.junit.jupiter.api.Assumptions class. To appreciate the value of assumptions, all you need is a simple example. In this case, if the condition doesn’t hold (Line 5), the body of the lambda will not be executed. The difference can be subtle, so use this rule of thumb: Use assertions to check the results of a test method. Use assumptions to determine whether to run the test method at all. An aborted test is not reported as a failure, meaning that failure won’t break the build. Note Line 5: If the condition doesn’t hold, then the test is skipped. In this case, the day of the week when the test runs is not Friday (5). This doesn’t affect the “green” of the project, and won’t cause the build to fail; all of the code in test method after assumeTrue() is simply skipped. Note that everything after the lambda will execute, regardless of whether the assumption in assumingThat() holds. Before we move on to the next section, I want to show you one last feature of writing unit tests in JUnit 5. Each unit test may have its own pre- and post-test lifecycle. This allows you to create the class under test using special conditions to test corner cases. Unit test method names just got simpler. In JUnit 4, all test methods exist as peers, where duplicate method names are not allowed (so you wind up with method names like testMethodButOnlyUnderThisOrThatCondition_2()). Starting with JUnit Jupiter, only methods in the nested class must have unique names. Listing 6 demonstrates. Note Line 6, where the JUnit5AppZeroOperandsTest class can have test methods. The results of any tests will be displayed as nested within the parent class, JUnit5AppTest. Writing unit tests is great, but it’s not of much use if you can’t run them. In this section I’ll show you how to run JUnit tests in Eclipse, using first Maven and then Gradle from the command line. The video below shows you how to clone the sample application code from GitHub and run tests in Eclipse. In the video, I also show you how to run the unit tests from the command line and from within Eclipse using Maven and Gradle. Eclipse has great support for both Maven and Gradle. Clone the HelloJUnit5 sample application from GitHub. Import the application into Eclipse. Run a single JUnit test from the HelloJUnit5 application from within Eclipse. Use Maven to run the HelloJUnit5 unit tests from the command line. Use Gradle to run the HelloJUnit5 unit tests from the command line. Now that you have the code on your machine, you can run JUnit tests inside of your Eclipse IDE. I’ll show you how to do that next. If you followed along with the video, you should already have the code imported into Eclipse. Now, open the Project Explorer view in Eclipse, and expand the HelloJUnit5 project until you see the JUnit5AppTest class under the src/test/java path. Now right-click JUnit5AppTest and choose Run As > JUnit Test. The JUnit view will come up when the unit tests run. You are now ready to complete the exercises for this tutorial. [INFO] Using 'UTF‑8' encoding to copy filtered resources. [INFO] Changes detected ‑ recompiling the module! ERROR StatusLogger No log4j2 configuration file found. Using default configuration: logging only errors to the console. Write JUnit Jupiter API unit tests. Implement the App class so your unit tests pass. In true, test-driven development (TDD) fashion, you will write the unit tests first, run them, and watch them all fail. Then you’ll write the implementation until the unit tests pass, at which point you’ll be done. Note that the JUnit5AppTest class comes out-of-the-box with only two test methods. Both will be “in the green” when you first run the class. To complete the exercises, you need to add the remaining code, including annotations to tell JUnit which test methods to run. Remember: if a class or method is not properly instrumented, JUnit will simply skip it. If you get stuck, check out the com.makotojava.learn.hellojunit5.solution package for the solution. Start with JUnit5AppTest.java. Open this file and follow the directions in the Javadoc comments. The Javadoc comments with raw HTML markup are shown in the editor window, but in the Javadoc window they are formatted and much easier to read. Write the implementation tested by the unit tests. Run the initial tests (using the IDE’s native JUnit support). JUnit 5 provides a class called JUnitPlatform, which allows you to run JUnit 5 tests within Eclipse. JUnit 5 in Eclipse: Eclipse currently understands JUnit 4, but does not yet provide native support for JUnit 5. Fortunately, that’s not a big deal for most unit tests! Unless you need to use some of the more complex features of JUnit 4, the JUnitPlatform class will be sufficient to write unit tests to fully exercise your application code. Make sure you’ve cloned the GitHub repository, then import the code into Eclipse as a new Maven project. Once the project is imported into Eclipse, open the Project Explorer view and expand the src/main/test node until you see JUnit5AppTest. To run it as a JUnit test, right-click on it, and choose Run As > JUnit Test. The functionality provided by App‘s single add() method is easily understood, and very simple by design. I didn’t want the business logic of a complicated application to get in the way of learning JUnit Jupiter. Once your unit tests pass, you are done! Remember that if you get stuck, you can take a look in the com.makotojava.learn.hellojunit5.solution package for the solution. In this first half of the JUnit 5 tutorial, I’ve introduced you to JUnit 5’s architecture and components, especially the JUnit Jupiter API. We’ve toured the annotations, assertions, and assumptions you’ll use most frequently in JUnit 5, and you’ve worked through a quick exercise demonstrating how to run tests in Eclipse, Maven, and Gradle. So where you do you go from here? The top five reasons you should be using JUnit 5 right now!